After reading Night Sky, I realized I need to read more Contemporary Young Adult Romances. What I liked most about “Night Sky” was reading Jameson’s point of view instead of a female character. It was weird reading from a guy’s perspective and reading what he was thinking. I’m used to switching back and forth to female and male characters, but it was all Jameson in this book. 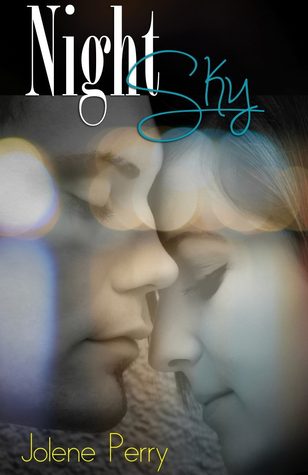 “Night Sky” takes you through a teenage boy’s difficulties in love, school, family, and friends. Jameson has loved his best friend Sarah for a while now, but unfortunately, she hooked up with her crush, who is a jock. Jameson is forced to be alone without Sarah because her boyfriend gets jealous when she is around him. Of course, Sarah is all about pleasing her boyfriend. Jameson is now having to adjust without Sarah until he meets the beautiful Sky one day while driving. He ends up picking her up and then realizes she lives near him. She’s not in high school like Jameson is. She’s attending college and living with her grandparents for a while. Jameson immediately wants to start hanging out with her, and she wants to hang out with him. Jameson falls head over heels for her, but of course, he still may have some feelings for his best friend, Sarah. Sky wants him to make up his mind. She tells him to be honest with her whenever they are together. He starts to realize he may be able to move on and have feelings for someone else like Sky once he realizes that Sarah doesn’t want to hang out anymore. Jameson then goes through family issues. His parents are not talking to each other and his Dad ups and leaves one day. Jameson is upset to find out; his Dad has left his Mom for another woman. It’s every teenage boy’s nightmare to see his Mom being put through something that he has no control over. Jameson wants to know why his Dad did it and why the other woman is more special. Towards the end of the book, Jameson finds out something about Sky that he can’t forgive her for in the story. She wanted him to be upfront with her, but it seemed she couldn’t be upfront with him. He was upset because she kept something that from him that didn’t both him. He would’ve loved Sky no matter what. “Night Sky” definitely is a very realistic book on what some teenage boys go through. I recommend this book to the contemporary young adult lovers out there. You’ll fall in love with the characters, just as much as I did. I know I felt very sympathetic to Jameson and then Sky towards the end. The things Jameson went through his Senior year and then at the end what happened before his graduation. He didn’t expect that. He didn’t expect a beautiful girl to change his world though. I felt sorry for Sky and what she went through also. I can understand why she would want to keep her secret from Jameson. I look forward to reading more books from Jolene Perry soon. Her writing style is much different from other Authors out there.